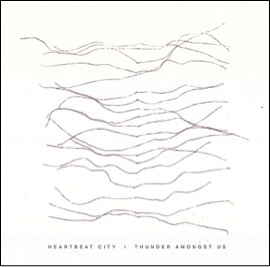 The first thing that strikes you when you listen to Thunder Amongst Us, the debut album from Winnipeg's Heartbeat City, is just how darn Canadian the record sounds. The album, which came out on August 7th, evokes thoughts of early '90s Canadian alternative acts like The Rheostatics or The Inbreds. That is most apparent on the angular, lo-fi "Small Victories" and the casual melodic "Grinner". The cold and desolate "Walker" has the same prairie aura as many a Neil Young song. However, the vocals sound much closer to Colin Meloy. A tremendous pop ear is on display as well. The layers upon layers of "Morpheus Rising" make it a gem. 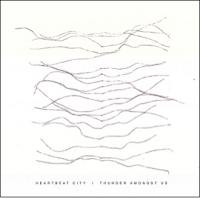 The standout "Tent City" is catchy as a result of parallel lead vocals that run throughout. It's a unique trick and one that works surprisingly well. A lick of harmonica never hurts either. Some of the tracks are underwhelming. "Darker Than" and "Ghost" simply exist, while the album closer "Organ Failure" is a clunker that drags on for far too long. Thunder Amongst Us is a solid debut. Though not everything is killer, there are some sparks of near genius present. Best tracks: "Tent City", "Walker"